Prefabrication is the process of assembling building systems to a nearly complete state offsite, and later delivering the component parts to the project site for installation. What was once considered a second-rate home, prefabricated or modular homes have overtime become a fashionable, fast, green, and cost-efficient way to create homes. Historically, buyers of prefab homes have had few options to choose from in terms of the look and design of the home. While economical in terms of production, the aesthetics of these homes were typically compromised. Often prefabricated homes looked like rectangular tin boxes, that most people thought of as an eye sore. However, today that trend is changing. More and more architects are improving the aesthetics and visual options for both the interior and exteriors of the homes. Robbie Antonio, a successful real estate developer in the Philippines, recently hired famous world class architects to improve the look and layout of these homes. These options are still very cost effective with the average home starting at $300,000. With the support of some of world’s best architects, these once thought “ugly structures” are now nicer than the average home. Most people would have a difficult time identifying a prefab home versus a home built on site. 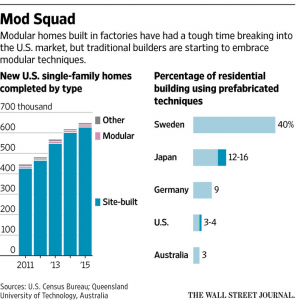 Modular homes are also now becoming more and more popular with investors. These homes are able to be built in a factory in as little as two weeks, and therefore investing in modular homes can result in a quick sale, and a fast influx of cash. Modular home manufacturers create different models for different investment options too. For example, Palm Harbor in Dallas, Texas, offers floor plans for single-family homes, as well as floor plans for duplexes and other rental properties. Lastly, modular homes are also being constructed to withstand the forces of natural disasters in catastrophe-prone geographies. In 2004, Hurricane Charley, which caused approximately $11 billion in damage, was a great example of the strength of modular homes. The homes manufactured by Palm Harbor withstood the 130 mph winds, despite being directly in the path of the hurricane. Palm Harbor’s survival rate during the second-worst hurricane in U.S. history, was extremely high. Today, modular homes offer future homeowners and investors an opportunity to purchase a home that is stylish, cost effective and engineered to withstand natural disasters. Next time you’re looking to buy, consider a prefab home.